The secular left cannot get a law through Congress that makes it illegal to practice Christianity. It would if it could. It can’t because it’s not politically plausible – at least not yet – and it would immediately be struck down by the Supreme Court if it could ever pass. At least as the Supreme Court is populated today and hopefully will be for a very long time. But that does not mean there is no threat to the ability of Christians to practice our faith legally. There is, and it’s not distant or merely theoretical. It’s clear and present. In fact, to some degree the legal prohibitions against the practice of Christianity are already in place. To understand this, you need to recognize three legal strategies the secular left is undertaking – right now, right under our noses – that making it difficult to practice Christianity without running afoul of the law. 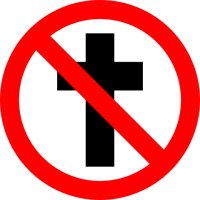 It is not an outright ban on the faith, but it could end up having the same effect by putting everything that’s central to Christianity in conflict with laws created ostensibly for other reasons.